From mire to punk rhythms, Bang OK Bang is composed of the former rhythm section of Nashville’s rock and roll powerhouse The One Through Tens. Musicians Abby Hairston and Ben Lowry have taken their sonic approach to music and turned it into a compilation of garage rock, punk, metal, and southern soul genres. The band is currently buzzing with critical acclaim and well-earned praise from their debut EP Chemicals. HIP Video Promo presents the raw and expressive video clip “Always For You,” a song that captures the true essence of Bang OK Bang’s songs. Nashville’s own Bang OK Bang are electrifying music listeners with their all-out, energetic sound. With comparisons to Black Sabbath, Fugazi, Queens of the Stone Age, Motorhead, and Slayer, this powerful rock duo is fascinating all alternative music fans. As they combine punk and metal elements with classic alternative beats, Bang OK Bang has created solid masterpieces of tracks. Their debut EP titled Chemicals has already gained critical acclaim. Released in July 2012, buzz worthy songs from the album have landed them radio play throughout Europe and the US, as well as within the alternative music scene. 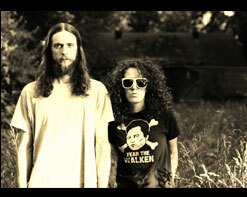 Abby Hairston and Ben Lowry were the rhythm section of one of Nashville’s finest The One Through Ten’s. However, they have transformed their origin into a captivating scene of high-energy music infused with their rhythmic upbringing. Bang OK Bang’s ability to surpass contemporary alternative musicians exists within their passionate blend of genres. On first listen, you feel as if you are listening to The Black Keys and Black Sabbath all at once. The energy behind their latest single “Always For You” emanates the fluidity of this duo. From the EP Chemicals, this clip offers continuous high-energy with psychedelic feels. RR Films presents “Always For You,” a captivating collection of scenes that describe the contents of Bang OK Bang’s music. The clip is altogether well rounded—flashing lights and colors bend as the band performs, and we watch as the video echoes certain alternative rock elements. The song itself sends us on a musical whirlwind, and in no time we find ourselves anticipating the return of that energetic chorus. “Always For You” represents Bang OK Bang’s demeanor, and sets forth a new era of alternative rock music. Captivating scenes of high energies and bright colors are what make “Always For You” so endearing to watch. The clip presents us with the emergence of Bang OK Bang’s exciting new music and captures a timelessness that is both contemporary and classic. For more information, please contact Andy Gesner and the HIP Video Promo staff at (732)-613-1779 or email us at HIPVideo@aol.com. You can also visit www.BangOKBang.com or www.Facebook.com/BangOKBang for more info on Bang OK Bang.